Eden Lake is 90 minutes of cruelty with genre tropes that obscure any intelligent commentary. With an 83% rating on Rotten Tomatoes and claims that it is ‘thought provoking’, one would expect Eden Lake to be cut above Hostel, Saw and other torture films that appear comparable. While it may be superior to a certain degree, it remains a decidedly shallow film that is too constrained by the tropes of its horror genre framework to be taken seriously. 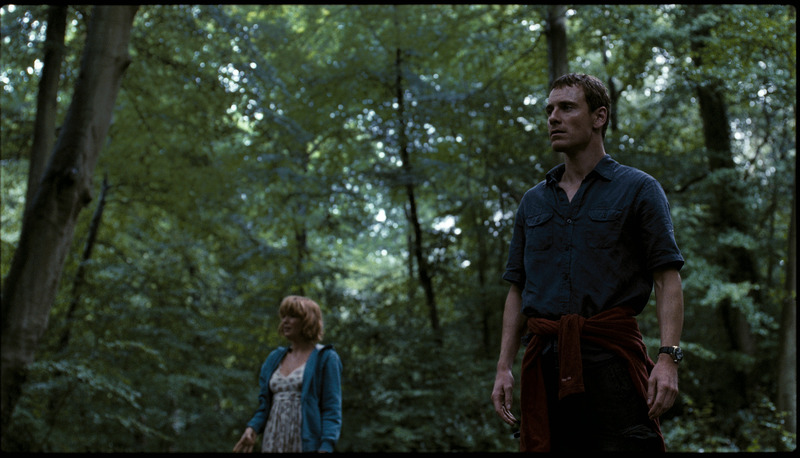 The film follows Jenny (Kelly Reilly) and Steve (Michael Fassbender), a young couple who retreat to the Midlands countryside for a romantic break. As the couple drive north of London, there is an ominous radio discussion about the state of education and the perceived animosity brewing between the young and the old, assembling its themes of ‘Broken Britain’ in a manner that is perhaps slightly obvious. After several disconcerting encounters with some obnoxious locals, the pair set up camp on the sandy banks of a flooded quarry. Their tranquility is soon interrupted by a chavvy young horde of Daily Mail proportions, led by the psychopathically aggressive Brett (Jack O’Connell). The conflict begins with general boorish behaviour and a wayward Rottweiler, and feeling the weight of his masculine responsibilities, Steve approaches the group and politely asks them to behave themselves. His reasonability is spurned and the couple are soon fighting for their lives in what is effectively their attackers’ back yard. Many barbarous things have happened when the aggressive and the controlling have attracted the meek and the impressionable. The first example that springs to mind is the 1993 abduction and murder of toddler James Bulger by two ten-year-olds, Robert Thompson and Jon Venables. The pair’s twisted crescendo of rebellion began with truancy and shoplifting, which led to the idea of abducting a child and pushing it into the path of an oncoming car, which finally led to James’s abduction from the Bootle Strand shopping centre and his brutally protracted murder on train tracks by Anfield Park. The two boys enabled and normalised each other’s behaviour, and the roles of ringleader and minion became quite clear in police interviews. Once arrested and interrogated by officers, Jon Venables was wrought with intense fear and remorse. He confessed to the killing, but was unable to tell the part of the story that he ominously called ‘the worst bit’. Conversely, Robert Thompson, described as ‘street wise way above the age of ten’, was hostile, dishonest and unrepentant. Thompson and Venables had a typical dynamic that became horribly toxic over a day’s truancy; it could inspire darkly compelling material for either print or cinema, providing it was created with intelligence and sensitivity. Eden Lake could have been this film. It could have been a mature and intelligent insight into senseless violence and the nihilistic, ignorant, vulnerable people who commonly commit it; a film in a similar vein to A Short Film About Killing or Boy A. Instead, the viewer gets a tropey horror film that focuses on neither the group nor the couple in a meaningful way. The film’s main concern is brutality, such as showing us what it looks like when a Stanley knife is forcibly entered into someone’s mouth. Despite Eden Lake‘s themes of class and age divide being highly superficial, political commentators have made the film fit their agendas. Owen Jones, one of The Guardian‘s most prominent PC enthusiasts, wrote the following in his book Chavs: ‘Here was a film arguing that the middle classes could no longer live alongside the quasi-bestial lower orders.’ Like many who are preoccupied with ideology and prone to knee jerk reactions, Jones mistakenly believes that the portrayal of one group of teenagers is supposed to be representative of an entire social group comprising millions of people. With good performances and uncompromising brutality, Eden Lake grips and shakes its audience quite effectively. However, it is mere viscera rather than political commentary, sharing more in common with The Last House on the Left than A Clockwork Orange.